During the Cuba–Caricom Day commemoration held on 8 December at the Ministry of Foreign Affairs in Havana, Cuban Deputy Foreign Minister Marcelino Medina recalled that history unites Caribbean countries, and reiterated Cuba’s commitment to continue strengthening the ties of friendship shared. In attendance were the Grenada Minister for Youth,Sports & Religious Affairs, Hon. Emmalin Pierre; and Ambassador of Grenada to Cuba, Ms Claris Charles. Cuba–Caricom Day commemorates 8 December 1972, when 4 Caribbean countries (Barbados, Guyana, Jamaica and Trinidad and Tobago) established diplomatic relations with Cuba despite US efforts to isolate the country. The date was agreed upon by the Caribbean Common Market and Cuba during a Summit held in Havana, in 2002. Medina recalled that the valiant decision made by those first 4 countries paved the way for others to establish relations with the revolutionary government in Cuba, which was under attack from the United States. Ambassador Charles John Corbette from the Commonwealth of Dominica, spoke for the Caribbean community, noting that while Cuba is not a rich country, it has always shared what it has with its neighbours. 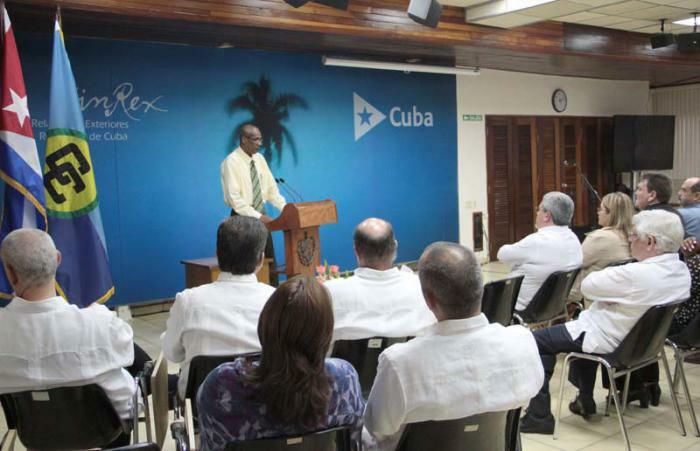 He emphasized the importance of collaborative efforts, in particular the opportunities for Caribbean students to study in Cuba. Also in attendance were Alfonso Múnera, general secretary of the Association of Caribbean States; Gustavo Cobreiro, rector of the University of Havana; members of the diplomatic corps; and Party leaders; as well as special guest Yasmine Thomas Girvan, widow of Dr Norman Paul Girvan, the eminent Jamaican intellectual. The cultural segment of the celebration was led by Cuban poet Nancy Morejón, and trovador William Vivanco.